Holiday season is in the air! I'll admit I’ve been dreaming of the holidays, and have listened to the Christmas channel on my Pandora account once or twice. Since my last couple of blog posts had a lot of fall themed ideas, and I still think it’s a little too early to bring out the Christmas decorations, I decided to focus more on some everyday simple projects that are not holiday themed. This is probably one of the simplest ideas I’ve seen; yet I probably never would have thought of this. 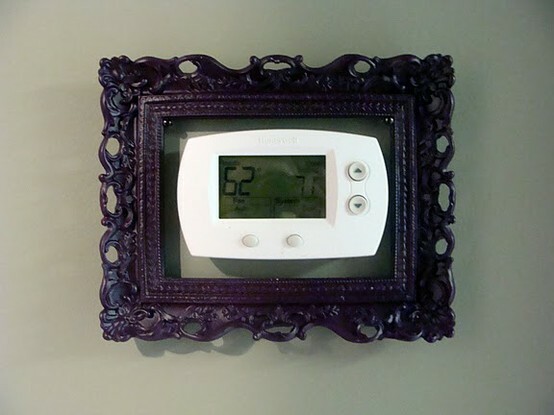 If you think the thermostat in your house is an eyesore. Dress it up! It’s shown here with a frame around the edges. You could find a frame that matches your style and spray paint it the perfect color. From an earlier blog, you could take the idea of painting a bird on the wall, making it perched on the thermostat. As much as I love shopping for home décor, the bathroom accessories always seem to fall a little short for me. Most of the options are in kid’s patterns or they all come in matching sets—shower curtain, linens, toothbrush holders, and soap dispensers. 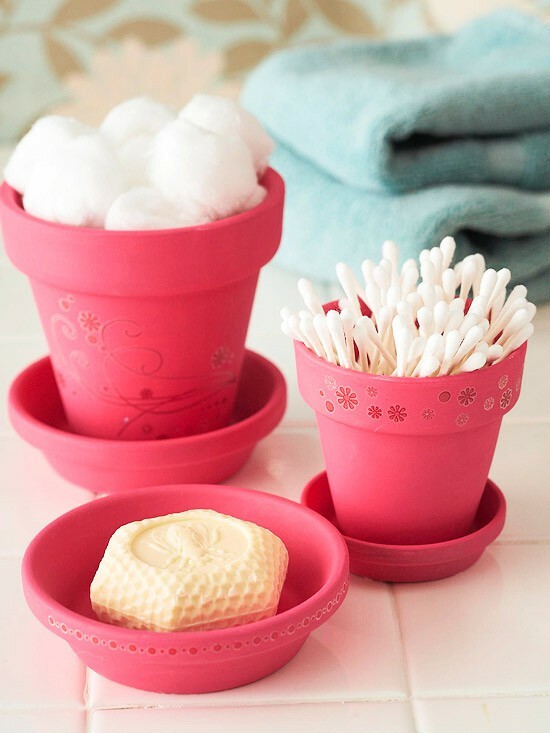 By making your own bathroom accessories, you can make them look exactly how you envision. Using flowerpots is a great idea for re-purposing an item too. For all the kids out there! If your kids are messy eaters this idea is adorable. Growing up, I think I had Disney placemats, and mats with maps! I loved being able to pick out which one I wanted to use at mealtime. I had forgotten all about them though until I saw these. 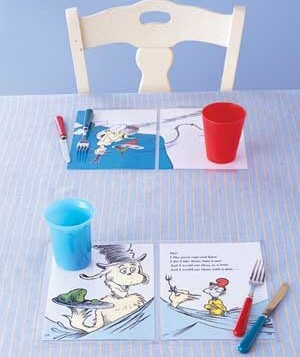 Easy to clean, and easy to store, these place mats will get your kids reading! Besides, Dr. Seuss books are great. Simply cut out two pages, lay them side by side and laminate them. You could take them somewhere to have them professionally laminated or use…. Looking for a way to make your place glow? These mason jars are perfect as nightlights, lining for a walkway, or simply decorating a table for a party. All you need are some glow sticks, scissors, and the jars themselves. Cut of the ends of the glow sticks and pour the liquid into the jars. Some small pieces of plastic or glass will come out of the sticks; be sure to pour those out of the jar and into the trash. Swirl the liquid from the glow sticks around in the jar. 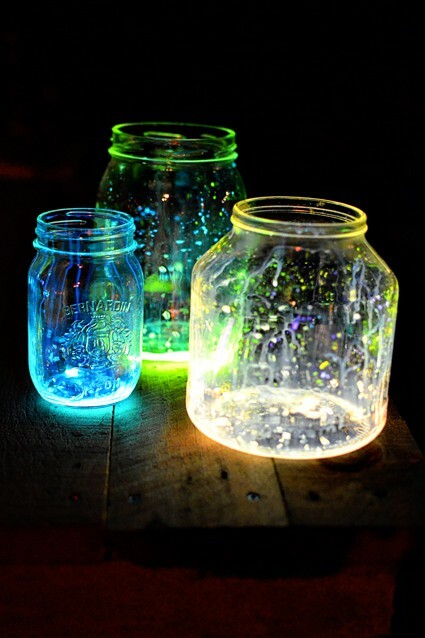 If you’re using the jars as nightlights in a kid’s room, you may want to put a lid on the jar. For more pictures go to http://www.intimateweddings.com/blog/diy-glow-jars-tutorial/. At the Farmer’s Market this past weekend, NCLAC had all the materials kids needed to make their own bookmarks. I think some of the adults there might have enjoyed it even more than the kids though. 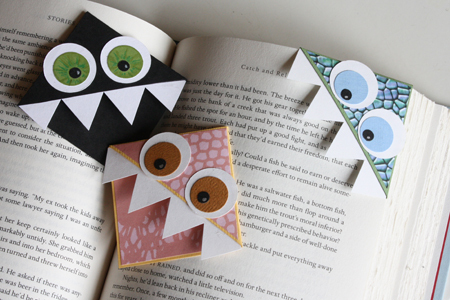 These bookmarks are more detailed but I can’t help but smile when I see them. They remind of me a cartoon trying to eat my page. I like the thought of putting one on the corner of your page also. These are different and unique! For step-by-step directions, go to http://nheilke.com/blog/?p=2628. This project may be one of my favorites. Now that it’s getting cold outside, for part of the day at least, I am craving some coffee. These coffee sleeves are adorable! This would be great because it is reusable, washable, and it shows off your personality much more than the brown, cardboard cup sleeve. I also love how they used a ponytail holder on it. I have tons of those! I’m feeling some inspiration for a handmade Christmas gift coming on. For directions on how to make this one, go to http://love-2-create.blogspot.com/2009/10/giveaway-2-coffee-cozy-starbucks.html. 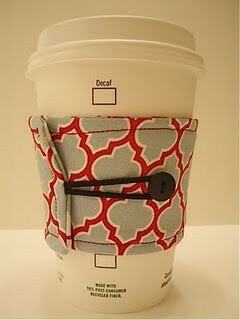 Another blog that is full of other sleeve designs is http://thecraftedsparrow.blogspot.com/2011/07/coffee-cozys-perfect-for-you-starbucks.html. I’m not sure exactly what all the craze is about with moustaches, but I have to admit, I really like it on these sleeves. Since I’ve posted before about making wreaths, I didn’t want to add too much about another wreath design…until it gets closer to Christmas. 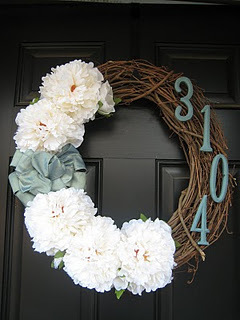 J I just wanted to share this picture of one that I loved though, and the blog page full of many other ideas for all the wreath lovers. I think what I love the most about this one are the colors used. To see the blog follow the link http://teachcraftlove.blogspot.com/search/label/Wreaths.